Ordering beautiful, high quality professional photo prints, canvas prints, photo gifts, cards and more is quick and easy with our ROES ordering software! Or go to the link below to access our online site for photo gifts and specialty items. 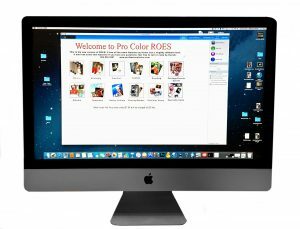 Pro Color ROES is your desktop computer solution for ordering, and it’s free to download. It’s easy to load your images in to the program and order thousands of different products. You can zoom, rotate, and crop with the click of a button. The pager feature makes design a breeze. This is available for Mac or PC. Under our Resources tab, you’ll find a quick overview of how the program works. Our new online ordering website that will allow you to order most of our specialty items without downloading ROES. This allows for ordering from both computers and mobile devices!